Los Angeles, CA, Monday, March 06, 2017– Executive Vice Presidents David Young and Chad Gahr, with NAI Capital represented the buyer, Peer Properties, in the purchase of a 25,792 square foot warehouse/distribution facility in Burbank, Calif. The seller was W. W. Grainger, Inc.
Grainger recently vacated the building and closed this particular branch location. 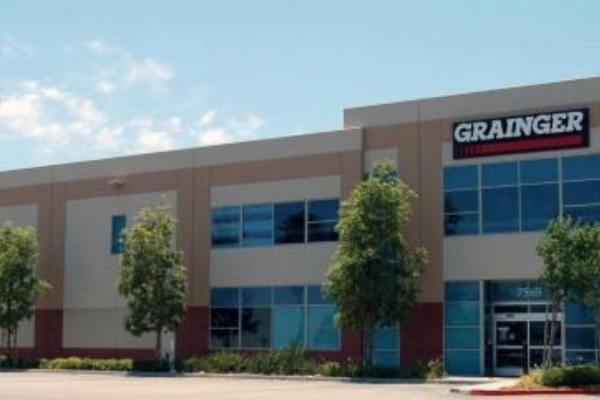 Founded in Chicago in 1927, Grainger is a Fortune 500 company specializing in business to business distribution of industrial supplies, MRO equipment, tools and materials. 7565 Lockheed Drive is a state-of-the-art, warehouse/distribution building, located within the Burbank Airport Commerce Center. Built in 2004, this concrete-tilt-up building provides 24’ warehouse clearance height, 2 dock high loading doors, 4,200 square feet of air conditioned office & showroom area and retail street identity on San Fernando Road. “Having originally represented the developer on the Burbank Airport Commerce Center project since its construction in 2003, we knew this building offered our client an excellent opportunity to purchase a best- in-class distribution building in a supply constrained market with tremendous barriers to entry. The property received tremendous interest from buyers when it came to market and generated multiple offers.” said Gahr. “Our client was coming out of a 1031 tax deferred exchange and was looking to purchase a quality asset as a long term hold for their portfolio. We are now actively marketing this building for lease for our client. We expect a quick lease up of the building due to the demand from entertainment, medical and aerospace companies searching for quality distribution space in Burbank,” said Young. The Burbank Airport Commerce Center is located proximate to both the major studios and the greater entertainment hub of Burbank. With immediate access to Interstate 5, the building provides superior distribution access to markets throughout Southern California.